The outgoing Governor of Ekiti State, Ayodele Fayose, has said he is ready to face the investigation team of the Economic and Financial Crimes Commission. According to a media report, the EFCC had already set up a special team to grill the governor for allegedly receiving over N1.2bn from a former National Security Adviser, Col Sambo Dasuki (retd.) through a former Minister of State for Defence, Senator Musiliu Obanikoro. Fayose, who said he had a clear conscience, told the commission to expect him in its office on October 16, a day after the expiration of his tenure. “He who has clear conscience fears no foe. The EFCC should still expect me at 1pm next Tuesday,” he said. Fayose spoke on Wednesday during the inauguration of a new school he built in his Afao-Ekiti home country as part of his legacies projects in the state. At the event, he asked workers to collect their outstanding four months’ salaries from the incoming governor, Dr Kayode Fayemi. He said the funds he could have used to pay them as expected had been withheld by the Federal Government ahead of Fayemi’s resumption. “They paid other states Paris Refund, they didn’t pay Ekiti; Fayemi should help me pay the money. “They didn’t pay Ekiti N2.2bn Budget Support Fund; my promise is fulfilled but the money is in the hands of the government, they should help me to pay.” The governor told the gathering that he did not borrow money from anywhere to fund any of the projects. “With all these legacy projects, I didn’t borrow any dime. I do not owe any debt, if they say I owe, they should show evidence of the transaction. 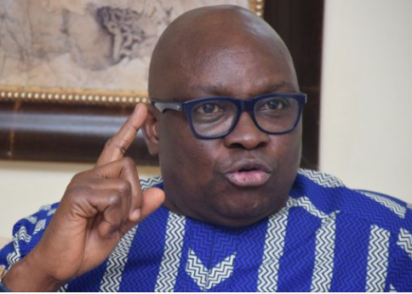 “Besides, no governor can borrow without the knowledge of the Ministry of Finance and the Debt Management Office.” Fayose urged the incoming administration not to neglect the school or abandon any legacy project. He said the school named Gifted Academy International would receive students from Ekiti and outside on 50:50 ratio. “The school is equipped with modern equipment, laboratories, furniture and Closed-Circuit Television for surveillance,” he said.